Dnipro Hydroelectric Station (Дніпровська ГЕС; Dniprovska HES). 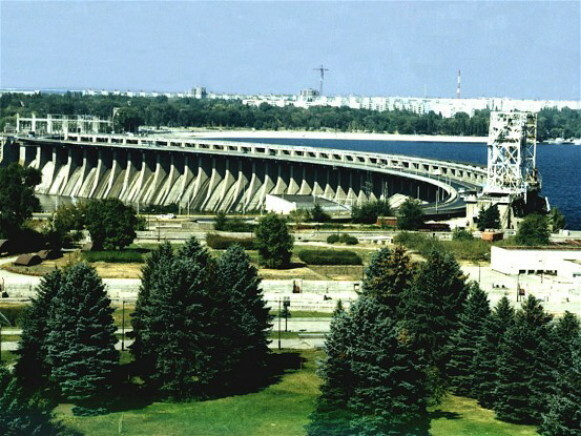 The largest hydroelectric station in Ukraine and, before the construction of the Volga stations, the largest in Europe. The station is located on the right bank of the Dnipro River above the city of Zaporizhia (and above Khortytsia Island, below the last rapids). The earliest plans for a hydroelectric station date back to 1905, but plans for a dam to inundate the Dnipro Rapids and make the whole length of the river navigable had been made in the 19th century. One of the designs for a station was proposed by a Ukrainian engineer, Mohylko. In the Soviet period Ivan Aleksandrov's plan was accepted. The Dniprohes was among the first 10 hydroelectric stations planned by the State Commission for the Electrification of Russia (GOELRO). Its construction by the Dniprobud trust began in 1927, and its potential was to be 558,000 kW. By 1932 the first five of its nine generators were in operation. American specialists under the direction of Col H. Cooper took part in the construction. All the building machines and the first electrical equipment were imported from the United States. 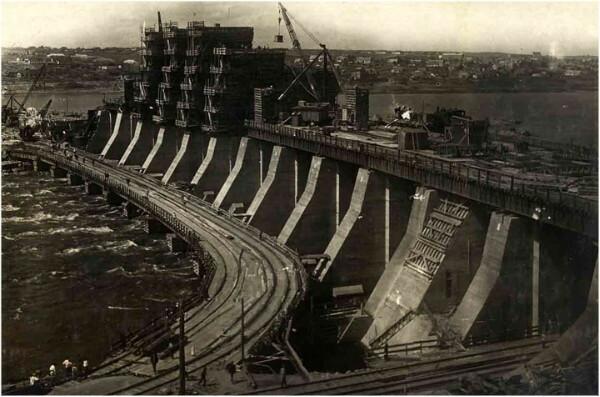 A reinforced-concrete dam 760 m long and 60 m high raised the water level of the Dnipro River 37.8 m and inundated the Dnipro Rapids, making the river navigable year-round. A three-chamber lock almost 2 km long on the left bank of the Dnipro enabled boats to bypass the dam. An enormous reservoir formed above the dam, filling the narrow valley of the Dnipro as far as the city of Dnipro. This artificial lake, known as the Dnipro Reservoir, is almost 140 km long, 1.5 km wide at its upper end and 3 km wide at its lower end, and reaches a depth of up to 60 m. The lake covers an area of 320 sq km and contains almost 1.5 billion cubic meters of water. Until the Second World War the Dnipro Station worked up to its designed capacity, except during the summer and autumn months, when the low water level in the reservoir drastically reduced the production of electric power (only two out of the nine generators were in operation and even those operated at a reduced capacity). In 1941 the retreating Soviet forces blew up the dam and evacuated or destroyed the electrical machines and equipment. The Germans partly rebuilt the station but destroyed it again when they began to retreat in 1943. In 1944–7 three aggregates were rebuilt, and the rest were rebuilt in the 1950s. In 1979 nine aggregates with a total capacity of 1,312,000 kW were in operation. The Dnipro Station does not meet the energy demands of the Dnipro region. Hence, even before the war the Dnipro Energy Ring (Prydniprovske enerhokiltse), which includes the Kamianske and Kryvyi Rih thermoelectric stations and electric stations belonging to plants, was created. 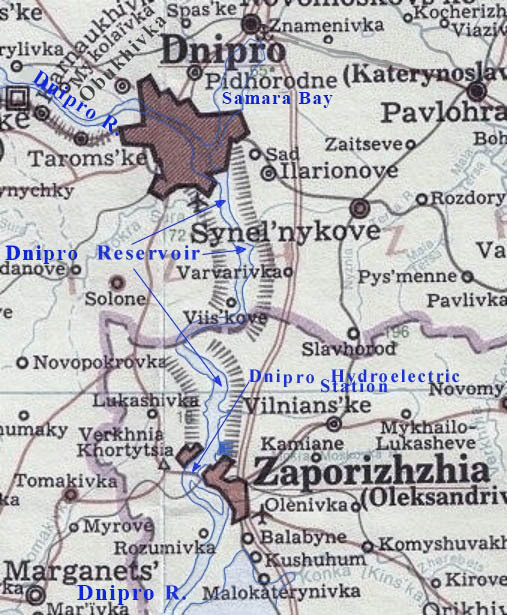 After the war the Dnipro energy system was integrated with the Donets system to form the Southern energy system. The uncertain balance of electric power in the Southern system was overcome only in 1955 when the Kakhovka Hydroelectric Station went into operation. In 1969 the construction of Dniprohes-2 and an additional lock was begun.